Well, I've seen blueprints of other houses and it is very specific and you have to be very very specific. Also, you have to be reasonable in your measurements and it can't be ridiculous. I would say that a mansion ( we're making that ) is about 5 to 6,000 square feet and it will probably worth 1 million dollars. We've learned different styles of making houses but the one that we made was more modern. We learned about different house ideas and adding unique things in our house to make it different. We found a good website and got to express our imagination very very far. I want to know how to make a blueprint of a house and do it like the professionals. I want to know what it is like to create a house and be a creator of a house. What Action did I take? We built a website and created a 2d house online and stretched our imagination on what we could add. We told people about the website and our house so they could see it. I will look at some of the ones that have already been made and work from there. There is nothing that much to research. What Questions do I still have? How long does it take to build a 3d real house? Is building a 3d house harder? How would our house look in 3d? Why do people create blueprints instead of creating a online? This project had to be one of my favorite passion times yet. I got to express my imagination so much. I was able to do whatever I wanted. The hard part was on the paper getting my measurements and doing the math but it looked cool at the end. The easiest part but the funnest part was choosing what to put in our house and actually putting it in. I would’ve been cool if we could a make a cardboard real 3d house but we obviously had no time for that. If you want to do this project, don’t be shy at all and just express yourself. I Enjoyed this project a lot because I got to do it with a friend instead of by myself. I also had fun building the house online, and it was fun building our huge garage and exploring what was on the website even though they didn’t have everything like we couldn’t find like a back-rounds like a lake but we still found things like air planes. Overall we had a lot of fun. Can We Teach Others To Earn Money On The Internet - Russell and Jeremy? 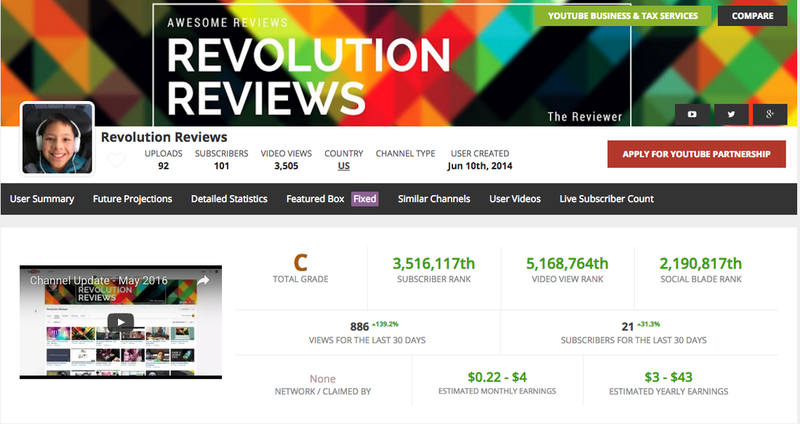 This is An Example Of A YouTube Channel Statistics About The Channel Grade And Profit! We learned a lot about 10+ more websites that can pay you directly for doing pretty much anything. You can take surveys or transcribe audios and you can earn something similar to minimum wage with a little bit of practice. We want to help people get money for free and to set up our own accounts and also some other ways to make money. Also it will be fun to create accounts and get some money. ​We want to enable people who might not be able to mow lawns help other people as well as themselves. 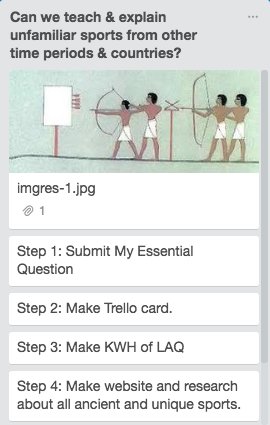 First we did our Trello and our KWH. After that for a really long time we researched a lot of different websites that will deposit money to your account. We had to try out a lot of different websites and make a video about each one. We recorded tons of videos and we made a final product. 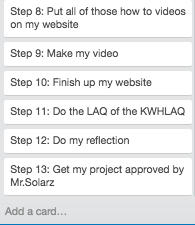 We will make a video explaining how to make each of these accounts and we will make our own accounts on video. ​Before doing this though, we must first create an account for the websites try them out and do a few of the things that they want you to do. Also we will explain which are trustworthy and which are not. We still have a few questions about some of the later websites as well as how you make an account for a few websites that we wanted to do a video for. Also we wanted to see if some of the websites that we were going to do are actually trustworthy because some people said they aren't but we want to try them for ourselves. Russell's Reflection - My experience with the project was super AWESOME! Some of the things I loved about this project is that we're able to explore the websites and sign up for it! When we were in the project we were able to make videos and making videos is very exciting! When I was exploring some of the websites some of them did seem that they could not be trusted. When we signed up for the website we took about thirty minutes exploring the website making sure they are can be trusted. Some of the flaws that we had in this project were that it was hard to find the best websites that we would be able trust! Overall I thought this project was one of the most fun projects in passion time and a great learning experience! I would also like to thank my partner Jeremy for working hard to make this project possible! I know a lot of things about this project. For example, I know that you have to follow all of the directions in order to get a good looking craft. Also, when I ever do a craft I always look at what I need before I start. This could come in handy because if you are trying to make a lava lamp and you forget the oil then your whole craft is going to be ruined. I also know, that you have to be extremely careful with everything you do. I learned a lot from this project. For example I learned that you are never too good for directions and that you should always look for them on whatever you do before you do it because if you do not something bad could happen. Also I learned that I have a really big passion for making crafts because I love the feeling of accomplishment. When ever I make a craft I always want to see the ending product so I try to do it as fast as I can. I want to know what crafts I can do at my house when I am bored or when I am doing nothing that day. I also want to know what I can put my crafty senses to. I really want to know what I can do to my best ability and not give up on something. ​What Action did I Take? I made a website that has all of the steps and directions for all of my crafts. This link will take you to the website. I also made a bunch of how to video's of how to do the crafts. ​How Will we Learn the Information? I will learn the information for researching different types of crafts. I will also watch video's to explain what the craft will look like. ​What Questions do I Still Have? I still have a lot of questions about my project. For example, can I make a whole movie about how to make crafts? I also still wonder what other types of crafts I can do because I really like doing these types of crafts? What types of things can I make that are more difficult and harder? I really really really liked this project! No, actually I loved this project even though there were some things that were hard. The only thing that was a really big bump was I could not find any crafts that were not babyish. When I was looking for more mature crafts I looked at youtube video's because usually they have really good crafts that are easy to make. Some things that were really really easy were making the crafts because all I had to do was get the ingredients and follow the directions and bamm!!! there is my craft. I have learned a lot from this project for example, as long as you put a little effort into the thing that you are doing it will work out. This is a really important part about making things because when you do things like try to make your own hydroponics in your backyard in a green house some things are going to go wrong and you can't get mad because of that you have to get excited because now you know that you have to put more effort into the project to make it work and do well. Over alkl I really liked this project! I know how to draw some cartoon figures and I also how some drawing tricks. I also know all of the technology that I need to know in order to make videos. I know different types of shading and angles that are used to draw different cartoon figures. I also know different drawing terms. I want to know if I can teach other how to make cartoon figures because I know how to draw different cartoon figures so I want to take it to the next level and teach others how to. I also want to know if I'm going to learn any new tricks from teaching other people about drawing cartoon figures. How will I learn this information? I learned different types of cartoon figures and I also learned how to draw them. I also learned that I am able to teach other people how to draw. I have about three views on each of my videos and I that means three people I have taught to draw different types of cartoon figures. I also learned the different shading and different angles on a cartoon figures and that is it! I think the action that I took was making my videos. It was difficult at some times and it was easy at some times but most of the time it was really fun. If I were to choose the next most action I took, it would probably be learning how to draw the cartoon figures. I know that fish like to eat different things and that if you want to catch a certain one you have to use a certain bait. Also you have to cast it to the right spot, you also have to choose the right bait for the color of the water that you fishing in. I learned what baits to use in different types of water like in darker water you want to brighter baits and in clearer water you want to use silver baits and colors like that. And I also learned where to fish in a lake like if your fishing for bass your going to want to fish in like weeds or like cover from wood or rocks. I want to know what to use to catch certain types of fish and is there any strategy to use them. I also want to know what type of line to use and I want to know where to fish. I will fish so I can learn and I will research and watch videos. I can also ask people who know a lot about fishing and get information from them. I still want to know how to not get baits snagged, and if you should use a more realistic looking bait or if it doesn't matter how realistic it looks. I also want to know if it matters how far you cast it for the certain bait that your using. I thought that this project was really fun and I think I learned a lot from it and I think it was a good use of my time. I think the website that I made it well, the project was really fun and I am exited to go fishing with the knowledge that I have! I think people will learn a lot from my project, and I think that I got a good amount of information to share. All in all I really liked this project and I think it was good for me! How Will I learn My Information? I know that cars have polluted less and the systems in cars have really improved so they could go a lot faster. I want to know what kind of changes have happened in cars' systems that changed it since the first automobile. I will research about how things have improved since the first car was sold to the public. I know that a lot of people don't like the new battlefront because it doesn't have that much offline play and no space battles. I know that the original Battlefronts were more liked and had space battles and lots of stuff. The graphics for the older battlefront were not great but the new Battlefronts graphics are unbelievable. I know that they made 2 older Battlefronts and they were made in around 2004 and 2005. So what I learned was that the older battlefront was better because of my list that I made which you can see on this link. I learned a bit about how they made the game and also what platform they used and everyone who made it. Over all I think I learned the most by comparing the battlefronts and also thinking of ways to improve it. I want to know why the makers of the new Battlefront didn't think of using movies 1,2,3 in the game because in the new one they only based it off 4,5,6. I would like to know what they are doing on the game right now because I have heard they are trying to make more playing offline like people are requesting. That is mainly what I would like to know about the new and old Battlefront. I took the action of first watching videos of the old battlefront and in my opinion the best, Battlefront II. 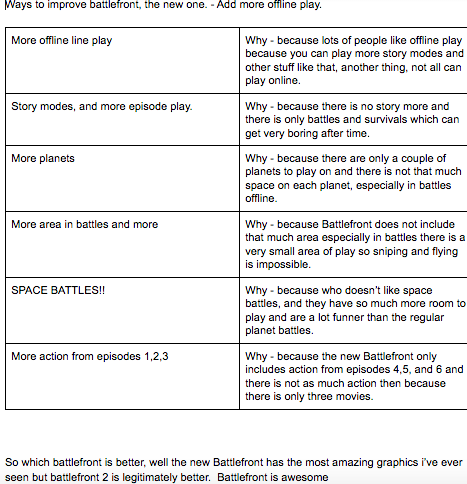 Then I made a comparison chart that included what the old Battlefront had that was good the the new one doesn't. Then I started watching videos from the new Battlefront which came out in mid November. Then I figured out all of the problems for the new game and found a way to fix them. I will learn some of this information by going onto the compony that made Battlefronts website, watch some YouTube videos and more. I plan to mainly think of ways to improve the new Battlefront so I could look at some reviews so I could think about what others think of the game. I hope to find out how I could make it better because I think the finding which one is better is easier. Some questions I still have is how they make the game and everything in it. I am also wondering how many people agree with me on my thoughts for Battlefront. I am also wondering if they are going to fix it and if they do will they do what I thought or will it be different. I Had a lot of fun during this project, it was the first project besides the first round project that I worked alone on. I really liked doing this project because I did have some background information and I am not that much of a gamer so it was a lot of learning for me. I also enjoyed watching some videos because I haven't watched many because my projects were mostly hands on and figuring out stuff on the way. This was not my favorite project so far because of my other awesome ones such as the stop motion movie, making my own car, etc. Overall I really enjoyed this project and hope to do more creative and fun projects and not just in passion time! Can I Find Unreasonable Science and Technology Examples in Star Wars and Explain Why it is Unreasonable Compared to Our Current Technology? - By: Regan R.
I learned a lot of new information about different Star Wars devices that are not possible, and never will be possible in our world. For example, I had almost no knowledge about plasma and how it works, and how it prevents lightsabers from being realistically made. I also didn't realize that the humans in Star Wars were unrealistic until I put some research into it. I want to know of a lot of unreasonable examples of science and technology in Star Wars, and be able to explain why it is unreasonable. I also want to know some reasonable examples of science and technology that I can find in Star Wars and I want to be able to explain why those are reasonable too. I created a website with four in-depth explanations about why a certain Star Wars tool or device is not possible in our world, and what makes it impossible. I also made a home page on the website explaining what the website is about and some things that will be included in the explanations. I will find my information by watching some video clips, and looking up some information online. I will get most of the information I use myself, because I will be coming up with most of my conclusions myself. I have seen all of the Star Wars movies, so I will be able to find my examples from a combination of what I think is unreasonable, and what is unreasonable compared to websites online. I am still wondering about some of the other elements of Star Wars, as I didn't accomplish as much as I hoped. I want to know about some of the reasonable examples of technology in Star Wars, like TIE Fighters and other spacecraft that use the same or similar technology. I also want to look at different creatures in the Star Wars universe and how they have evolved according to their habitat. I really enjoyed working on my project for several different reasons. I obviously am obsessed with Star Wars, which is why I chose my topic, and I thought it would be cool to actually point out some flaws that are in the movies. I think I need to lower my expectations for the outcomes of my projects in the future, because I expected to have a much larger website with many more sections to it. I feel that I should have spent less time on each individual page on the website, giving me more time to make different pages, because I feel like my website is lacking other elements to it. Some good things about my project are that my five pages have a lot of detail and have in-depth explanations about multiple topics. I have checked my project over several times for spelling and grammatical errors to improve the professionalism of the website and entire project. Overall, I think I was relatively successful with my last Passion Time, and I had a lot of fun working on it. Be polite and be classy. Wear nice clothes for good first impression. Add humor and be appropriate. We know how to act on camera with our past experiences in Mr. Solarz's class. We know how to do a lot of good thing with the green screen, and Imovie to include the latest news. We learned how to act on different talk shows and with the green-screens. We learned all of the newest news around sports. We learned how to insert the clips into Imovie and make our movie. What it is like being on a talk show with the camera. How the show is going to go with this being our first time. If we can keep our composure and be ok on camera with this big of a thing. If we can try to not cut each other off and hold our thoughts and wait till the other person is done. What ACTION did we take? We made our website to share with the whole world. We made our video that is published and live that people can see if they don't want to learn it themselves. The site on paulsolarz.weebly.com is also open and has the long short of our project. HOW will we learn the information? We will use research to check out all of the new news that we need to say in our video. We will look up what to do on different talk shows we will use the internet for that as well. What QUESTIONS do we still have? How can we keep our pace and still get a couple of videos done and still meet all of his requirements? How do different companies do all of this in a couple hours when it probably took us like 11 periods or 11 hours. How can we get ourselves to learn as much as possible about the other leagues that we don't know as much about? Alex's Reflection: I really liked the project not just because it was hands on and I got to do what I wanted to do. Mainly because I really like learning about the newest news from all around the world, I also really like talking about the things that I good at and one of those things is the NHL. Tyler is a really good partner because he has completely different strengths than me, he is good with Imovie and the clips, I'm not. He knows about the NBA I know about the NHL. We both have very different strengths. Which really helped us in this project because we didn't have to research to much which saved us some time. 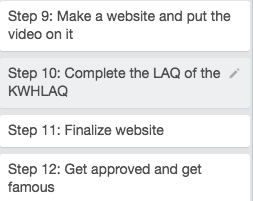 We really needed that time to because we spent a lot of time finalizing the video compared to making our website and the KWHLAQ. Tyler's Reflection: This passion time with Alex has been so so fun, I loved filming the newscast, and coming up with the whole question was just really fun. In this round Alex and I both got to learn about a topic that we both enjoy, sports. We both love sports, I did the NBA portion of the newscast and then Alex really surprised me with how much he knew about the NHL. Then we both know about MLB, he likes the Cubs and I'm a huge Sox fan. It was a bit tough at the editing part for me, It took a long time because I had to find the clips then put them into the movie, since we have different green screens for different clips. But all in all I really loved this round that we did, It was a good way to end the year. We know that there are lots of unique sports all throughout the world. Each continent has there own type of sport. Some continents sports are ALOT different form other continents but some are almost exactly the same. The sports can some times just be for fun but others are a very big deal and some people may be executed if they were to lose. I learned that there are lots of different unique sports around the world. Some of the sports may not be weird at all in some countries but very unique in others. It was cool to learn about all the different sports and how they play them. One more thing that was really fun to watch different videos about all the different sports and how the different sports are played and finally why they are played. ​What do I want to Know? We want to know what are the most unique sports there are around the world. We also want to know how the sport was made and how long people have been playing this sport. One more thing that we want is what is the difference between each sport in each continent. We took many actions including by doing more a whole thing section on continents where you have one sport from each continent in the world. We also made sure that every page was completed and had we had very descriptive facts for each sport. ​How will I learn this information? We will learn the information from different websites that have lots of facts about different unique sports and how they are different. One question we still have is why do people volunteer for dangerous sports that don't make any sense in doing even if you know it's not going to be safe? This project was very fun for me. It was really cool to learn about all the different sports around the world and how all of them are very different. 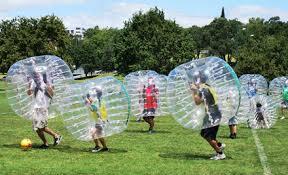 My favorite sport was probably zorbing because it was very unique and funny and the same time. It was cool to look at where the sports are from and maybe try to do them one time. One thing I would to do different is to not do as many sports and make sure to get as much facts as possible. Another thing that I liked is how we were able to go to different top ten websites and see the different very unique sports around the world. One more thing that I would do differently is to maybe try and and use lots of different websites and get facts from different sources to not use the same one.